As a rod maker , I have made a commitment to all Fly fishermen/women who fish bamboo , that not only will I build quality cane rods , but that I will also do quality repair and restoration work on cane fly rods , regardless of their condition, or the maker of the rod. 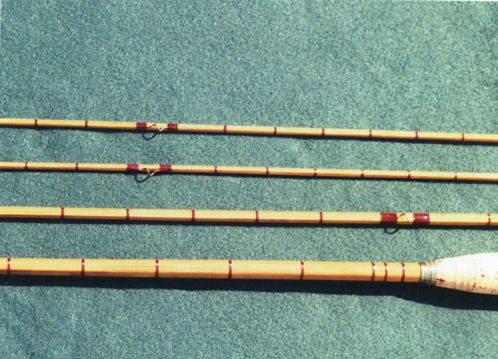 By doing so , the rods of the makers many years past , can be shared on the stream with the rods made by today's makers , and hopefully future generations can experience the thrill of catching trout while fishing bamboo. Cleaning , replacing , re-manufacturing of wood filler insert. Cleaning , restoring , replacing with grade a+ rings and re-manufacturing a lathe turned cork handle --(these handles can be sized to your hands grip , ask for details). Regluing , rewrapping with color matched silk's , refinishing. Construction of a new section (taper and action retained) , rewrapping with color matched silk's , recoating to original finish. Complete rework of the rod , reel seat , cork handle , stripping rod , straightening of sections , rewrapping , and dip varnishing. What modern fly-line does my bamboo fly rod use? 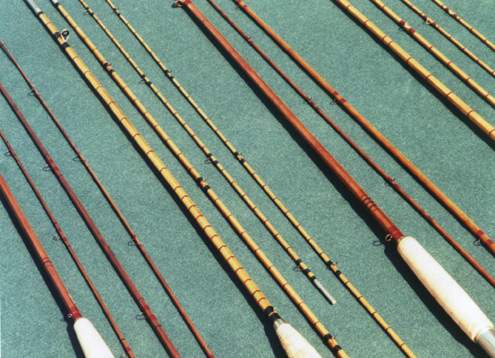 All rods repaired or restored at the shop will be matched to the correct line size for that rod , and your invoice will include a note stating the best line size suited for your rod. If you send your reel with your repair/restoration we can for a reasonable fee fill your reel spool with new backing , and the fly-line sized to match your rods action. All work is covered as our new rod guarantee policy. Copyright Â© 2002 Niemiera Fly Rods Inc.